The national focus on the Husky women’s basketball team, as it moves toward possibly surpassing the record 88-game winning streak of the 1971-1974 UCLA men’s team, has not quite reached the level of the 1973 Battle of the Sexes in tennis between Billie Jean King and Bobby Riggs. No. 1-ranked UConn tied the unbeaten streak of John Wooden’s UCLA team on Sunday with an 81-50 win over No. 11 Ohio State in the Maggie Dixon Classic at Madison Square Garden. And they can own the streak by defeating No. 15 Florida State on Tuesday night (7 p.m., ESPN2) at the XL Center in Hartford. Beyond having a Hall of Fame coach leading each team, it is not simple to compare teams of men and women from different eras playing schedules of varying competition for their respective time periods. In the minds of some veteran reporters, because men’s and women’s basketball records are maintained separately, discussion of the teams is an interesting debate but the two are not comparable – even 37 years after King’s defeat of Riggs began a landmark shift toward equality for women competing in sports. Doris Burke of ESPN, one of the few analysts to cover both men’s and women’s college basketball, is also not interested in fanning the flames of a UConn women-UCLA men debate. 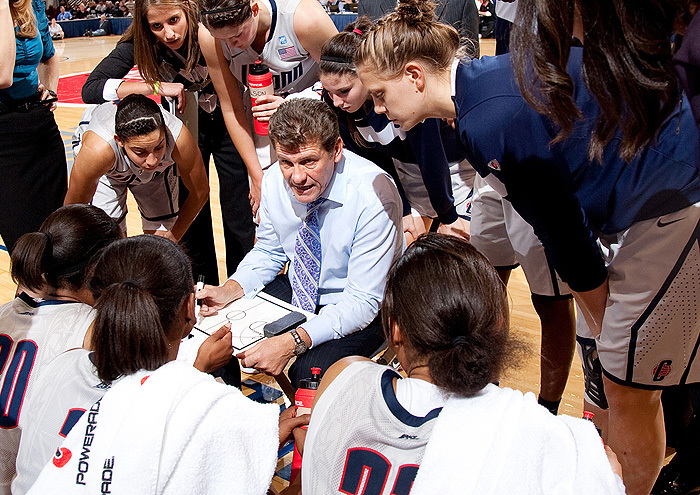 Coach Geno Auriemma talks strategy with his team. Paul Assaiante, head coach of the men’s squash team at Trinity College in Hartford, which as of its winter break has won 228 consecutive matches over the past 12 years, understands Auriemma’s approach to handling the winning streak, even as he tries to continue his own team’s record performance. Assaiante says focusing attention on a winning streak or anything else that can be a distraction will affect how well the team will play during a game. After a game won by the Huskies, it is not uncommon for opposing coaches to note how hard Auriemma’s team works on each play, whether offense or defense, something they don’t often see when playing other teams. Even the most experienced coaches express some astonishment. In recent weeks, after UConn has notched another win, reporters have asked coaches about the confidence the Huskies project from the moment they arrive on the court for pre-game warm-ups. Opposing coaches are also asked about how intimidated their players might be before facing the Huskies, whom they see on television and suddenly find standing next them on the hardwood. Rotella, who has known Auriemma since his days as an assistant for the women’s basketball team at Virginia, sees common attributes in how successful coaches work with their student-athletes. 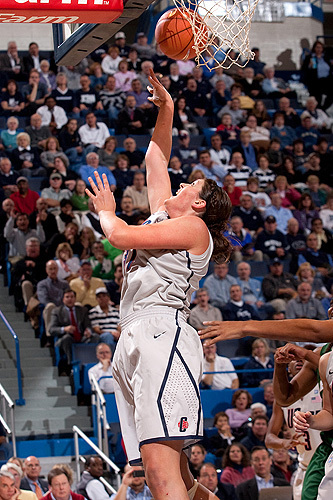 As Auriemma noted before the 2010-2011 season began, especially with a team that now relies on so many first-year players – including guard Bria Hartley, forward Samarie Walker, and center Stefanie Dolson – the Huskies’ winning streak likely will end at some point this season. 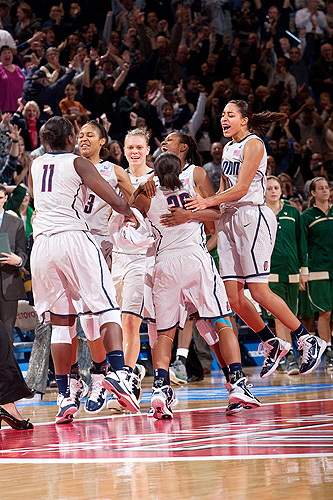 Whether the UConn winning streak ends Tuesday in Hartford or on Dec. 30 when the Huskies play at No. 3 Stanford, or some other time this season or next, Assaiante, the Trinity squash coach, says the Huskies will move on – just as his team will, whenever its winning streak ends. “I know when it happens, we’ll deal with it,” he says. “Of course we’re going to lose, but we’re going to make it really hard for the other guy to get over us. We share the moment in every contest. We’re one big family. We share the wins, we’ll share the loss. … You take the information from that experience and you move forward. Rotella, the sports psychologist, says he hears echoes of Wooden in Auriemma’s psychological approach to coaching.